The muscle car craze started with the release of the 1964 Pontiac GTO. At the time, the GTO struck a chord with young buyers. Within a few short years thereafter just about every U.S. Automaker had its own version of the GTO. As the old saying goes, imitation is the sincerest form of flattery. For U.S. Automakers it was simply case of wanting in on this cash cow Pontiac had stumbled upon. Performance oriented cars were available before the GTO. Technically it all started when Ford back in 1932 during the Great Depression decided to drop in a flathead V8 engine into its Model-B. Oldsmobile later in 1948 released the first modern V8 – the overhead valve (OHV) V8 (without the OHV V8 there would have not been a muscle car era). By the 1950s other automakers were releasing OHV V8s. Chrysler was making history with its first generation Hemi V8 by the late-1950s. By the early-1960s Chevrolet, Ford, and Pontiac were battling it out on the racing circuit with large displacement V8 motors. Pontiac built a credible reputation with the potent Super Duty 421 CID V8 powered Catalina. Suddenly in 1963, GM banned all its car divisions from direct racing support. Chevrolet and Pontiac which had benefited greatly in the area of engine development from direct racing involvement were now going to have to forge into a new direction to keep their respective performance images alive. Pontiac up until the 1950s was GM’s stogy division similar to what Buick’s role has been for GM in recent years. By the late-1950s Pontiac began stressing performance and started marketing to the youth market. By the early 1960s new releases like the 1962 Pontiac Grand Prix were helping to change Pontiac’s image. By 1964 Pontiac released the ultimate performance car – the GTO. The GTO came to be known as the first muscle car. Though there were performance cars before 1964, what made the GTO different was that it was a very light car with a large displacement high-performance motor. Before the GTO, generally auto manufacturers reserved their most powerful engines for their biggest cars. Though the Corvette and 2-seater Thunderbird could be had with hot motors they were more upscale cars, out of reach of the average buyer. The GTO was built on the bare-bones Pontiac Tempest (GM A-body) platform which meant buyers with even the most modest of incomes could afford one. What Pontiac added with the GTO package was a high-performance 389 CID V8 with either a 4-bbl carburetor (325 horsepower) or tri-power (three 2-bbl carburetor – 348 horsepower) setup, dual exhaust, and a few other goodies. The package made the plain Jane Tempest a very desirable car. As they say the rest is history, Pontiac had created a legend and 32,450 GTOs were produced that first year. John DeLorean (Pontiac’s chief engineer at the time) and his crew at Pontiac had to jump through hoops to get the GTO produced. The problem was GM’s self imposed regulation that prohibited any intermediate sized car from having an engine of more than 330 CID. To make a long story short DeLorean and his team defied the top GM brass and released the 389 CID V8 powered GTO. DeLorean and his team could have killed their careers at GM with this act alone, but the GTO’s success proved their gamble right. Things got even better for the GTO in 1965. The 1965 GTO had returned as a Tempest option package (1966 would be the first year the GTO would officially be a separate model). An update of the GTO exterior gave the GTO a sleeker look than the previous year. And the GTO package’s “GTO” badges and bulged hood scoop with twin inlets gave the GTO enough of a distinction over the Tempest based Pontiac LeMans. The overall look of the 1965 GTO was mean – it looked like a street brawler compared to the 1964 GTO which had a more conservative look. The 1965 GTO shared double-decker quad headlights and a deep split grille with the LeMans, which was first seen on the full-size 1963 Pontiacs. This look would define the general appearance of the mid-1960s Pontiacs and forge Pontiac’s youthful image enabling it to sell a lot of cars. Even to this day there are many GTO fans, who will swear that the 1965 GTO was the best looking of all the GTOs. In essence the 1965 GTO had the very stylish look of the full-size Pontiac lineup in a smaller and lighter package; it was a muscle car fan’s dream come true. Externally the GTO looked as if the new front-end and rear design were the only changes to the Tempest GTO platform for 1964. However underneath – the frame received some serious strengthening. The 1963 Tempest had unit-body construction which was light and fairly strong. However it was decided the 1964 Tempest would go back to a body-on-frame design which traditionally is stronger in nature than a unit-body. The new 1964 Tempest frame was light and was not as strong as it could be. There was a possibility if a high horsepower motor (600 plus) with lots of torque could cause the frame to twist. Most GTO buyers would never have to worry about this problem. But heavily modified 1964 GTO drag racing cars, could run into this problem. Fortunately the frame for the 1965 Tempest was fortified and the problems with the possibility of body twist on a heavily modified GTO were put to rest. This came at a small price to the GTO which gained around 100 extra pounds compared to the 1964 GTO. Of course some of this extra weight could be attributed to the overall length increase of 3 inches from 1964 to 1965 (total length of the 1965 GTO was 206.1 inches). The wheelbase of the 1965 GTO was unchanged from the previous year, it remained at 115 inches. The interior of the GTO was also very appealing. Sliding into the interior of the 1965 GTO there was no mistaking this was a sporty and youthful car. For 1965 bucket seats were standard and so were sporty round gauges. The dash on the driver’s side had attractive simulated woodgrain trim with engine-turned aluminum accents. The engine-turned aluminum dash accents would be available on the GTO for many years. By the 1970s Pontiac would use this theme to the extreme in the second generation Trans Am with great results. Another second generation Trans Am favorite is the dual splitter exhaust tips which were located directly behind the rear wheels and were standard on the 1964, 1965, and 1972 GTO. For 1965 there were three flavors of the GTO – the 2-door hardtop, 2-door sport coupe, and 2-door convertible. The rarest of the three was the sport coupe (sometimes referred to as the “pillar coupe”) which had a pillar between the front side windows and rear side windows. A majority of GTOs produced for 1965 were the 2-door hardtop model. Looks were important but it was performance that sold the GTO. Returning as the GTO’s base motor was the 389 with the Carter AFB 4-bbl carburetor. The GTO’s Tri-Power 389 returned as the optional GTO motor. The Tri-Power setup just like in 1964 consisted of three Rochester 2-bbl carburetors. At wide open throttle, theTri-Power 389 had a very distinctive sound. In some respects the sound was more racing in nature due to six barrels of carburetion bellowing (at wide open throttle) than the standard four barrels of most muscle cars. Interesting to note, with the Tri-Power setup there was a Ram Air kit available from Pontiac’s dealership network to convert the hood scoop to full functionality. 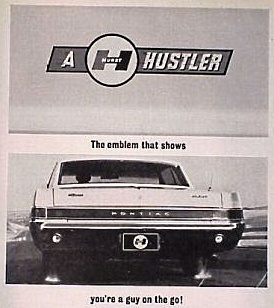 Pontiac felt this dealer option was popular enough to offer it in 1966 as a factory option. The added benefit of the Ram Air system was not just extra horses from the cold air which rolled off the front part of the hood into the engine but the increased roar from the Tri-Power setup. Any Ram-Air Tri-Power owner can testify that this is a beautiful sound. Looking at the Tri-Power setup when the hood is raised is similar to looking at the Mona Lisa. From the three small round chrome air filter assemblies to the beautiful Pontiac blue painted engine block and the chrome valve covers; there was no mistaking that the Tri-Power 389 was indeed a beautiful work of art. This was back in the day when manufacturers made engine bays as appealing as the interior of a car. Unlike today where black engine blocks and ugly black plastic shrouding is all that you see when you pop the hood of a modern performance car. Tri-Power would eventually be replaced by a Rochester Quadrajet 4-bbl in 1967, something was lost when that happened horsepower would remain up but the uniqueness was gone. The good news for 1965 was that both GTO engines had a slight horsepower bump. The GTO’s base 4-bbl 389 was up 10 horsepower to 335 and the Tri-Power 389 was up 12 horsepower to 360. Most of the increase was due to a hotter camshaft and improved intake manifold flow for both engines. Torque for the 4-bbl 389 was bumped from 428 to 431 lb-ft while torque for the Tri-Power 389 dropped from 428 to 424 lb-ft. The Tri-Power 1965 GTO went 0-60 mph in 5.8 seconds and the 1/4 mile in 14.5 seconds at 100 mph (Car Life magazine, May 1965), which was mighty impressive. And Car Life on another occasion tested a base 4-bbl 389 1965 GTO and managed a 6.6 second 0-60 mph time and a 1/4 mile of 14.8 seconds at 99 mph. This was proof that those buyers who could not afford the Tri-Power setup could still get great performance. There were three available transmission choices on the GTO: a 3-speed manual, 4-speed manual, and a 2-speed automatic transmission. There was a standard floor mounted Hurst shifter with both the 3-speed and 4-speed manual transmissions – another sign DeLorean and his team knew their audience. The benefit of the Hurst shifter was it could take the punishment of speed/hard shifts and the throws between gears were short. Rear gear ratios available on the 1965 GTO started at 3:08 and went all the way up to 4:33. The real hidden value of the 1965 GTO was its low base price of $2,751. As a comparison the base price of the 1965 Corvette was $4,106 which was a lot more expensive than the GTO and out of reach for most young buyers. However that is the not entire story, for $4,106 the Corvette buyer got the base 250 horsepower 327 CID V8 while the GTO buyer got 335 horsepower for $2,751. With this type of performance at such a low entry level price that young buyers could afford, is it any small wonder that GTO sales for 1965 skyrocketed? 75,352 GTOs were sold for the 1965 model year which was more than double the 1964 sales figures. The GTO name was borrowed (or shall we say taken) from the 1962-1964 Ferrari 250 GTO (GTO was short for Gran Turismo Omologato). The Ferrari 250 GTO was one of the best handling sports cars in the world, of course it came with a beefy world class price tag to prove it. The Pontiac GTO was one of the best handling American cars but it paled in comparison to the race bred Ferrari 250 GTO. The Pontiac GTO was born in an era when a performance car was not measured by its handling capabilities. This was a time before skidpad tests; it was all about how fast you went in a straight line. Believe it or not some work did occur into the design of the GTO’s suspension, DeLorean and his team had tweaked the Tempest suspension to make it suitable for the GTO name. The front anti-sway bar was stiffer than the Tempest’s. However there was no rear anti-roll bar which would have helped to improve handling; it would be a few years later when one would be available on the GTO. To sum up the handling – it was fairly stable at normal speeds but if you went too fast into a hair pin turn, it was prayer time. And prayers were also reserved for the four wheel drum brakes, unlike the 1965 Corvette (which had standard four-wheel disc brakes) four-wheel disc brakes were not an option on the GTO. For the GTO it was four-wheel drum brakes (though better than the run of the mill braking system of its day), not the best setup to have under high speed situations. Tires were inadequate in all cars of this era; bias tires were the only game in town. Though the GTO’s tires were a little wider than the standard tire of this era, they really did not help handling. In fact a GTO owner can see a big difference in handling by just installing a set of modern performance tires (such as BF Goodrich Radial T/A tires) on the GTO’s stock 14 inch wheels. Steering was also not the strong point of cars of this era, however the GTO’s was better than most. The fact still remains that what the GTO offered was the best all-around performance money could buy for 1965. The GTO created the muscle car segment and elevated Pontiac to a true performance-oriented brand. GTO sales would increase in the following years even amongst heavy competition. When the 1970s arrived the party was over; skyrocketing insurance rates and new government regulations crushed muscle car sales across the board. The GTO, as did most muscle cars, fell victim to the times – 1974 would be its last stand. Pontiac would later release a modern GTO for 2004-2006 based on the performance-oriented (Australian made) Holden Monaro coupe, unfortunately absent was the magic of the original GTO. Today the 1965 GTO is more popular than ever, and its appeal will remain for as long as muscle cars are revered which I hope is many years to come – it truly is a legend.